NOTES: Ducks F Carter Rowney had two assists in his first multi-point game since Jan. 13. … Lindholm missed his first game of the season, while Monahan sat out for only the third time. Calgary D Mark Giordano, T.J. Brodie, Travis Hamonic and Noah Hanifin sat out their second straight games. 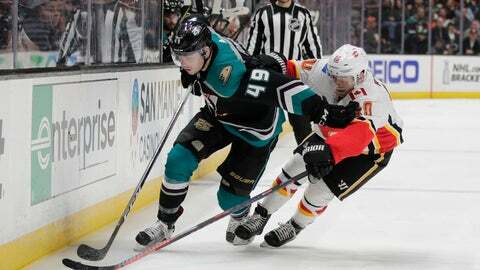 … Flames C Sam Bennett sat for the eighth time in 10 games. He took a big hit Monday night in Los Angeles, but isn’t thought to be seriously injured. … Anaheim D Josh Manson missed his third straight game with an upper-body injury. C Ryan Kesler remained out since March 6 with a career-threatening hip problem.